The item Dragon hunter, (electronic resource) represents a specific, individual, material embodiment of a distinct intellectual or artistic creation found in San Francisco Public Library. Orphaned as a baby when his parents were killed in a vicious orc attack, Kendrick of Elwood was raised by his elder brother, Darius. Though only nine at the time, Darius devoted his life to Kendrick's care and to purging orcs from their land. As Darius grew into a great warrior, he sheltered Kendrick from all possible harm. Now, after years of absence, a new danger emerges, more lethal than the threat of orcs or men. Reports of dragon attacks spread like wildfire through the panicked land. 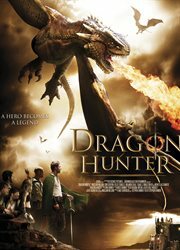 In memory of his mother's prophesies of a mighty Dragon Hunter in their bloodline, Darius leads Kendrick on a perilous journey to the castle of Ocard -- the Dragon Hunter training grounds.As they battle through evil men and orc-infested lands, they align with a band of rogue warriors who swear their allegiance in this hazardous quest. The Brothers of Elwood, joined by Raya, an elven princess, Olick, a mute Berserker, and five human mercenaries must escape orc ambushes and dragon attacks to reach the fortress at Ocard. Upon arrival, Kendrick learns that he, not his warrior brother, is prophesied to wear the Dragon Hunter mantle, a destiny that he cannot escape. When the dragon strikes with renewed ferocity, Kendrick must devise a plan to hunt and conquer the deadly beast, and inherit his true identity -- the Dragon Hunter!